- Top-Selling English courses in US, UK, Italy, Spain, France, Germany, Brazil, China, Russia, etc. - CONVENIENT: learn from your mobile device anytime, anywhere. - EFFECTIVE: research-based innovative mobile immersion methodology that develops all skills you need at your own pace. - RELEVANT: learn to communicate about real world topics. - FUN: animated videos and interactive exercises. Learn what you actually need: 30 conversational lessons based on real-life situations designed to give you the ability to communicate and understand people from Lesson 1! o BE SOCIAL: Introduce yourself and greet others, describe yourself, talk about your background, your profession, your family. Describe your hobbies, favorite music, cuisine, travels and more! o TRAVEL: Learn to check into a hotel, go shopping, order food in a restaurant; ask for directions, use the internet at a café; ask for clarification when you do not understand something and much more! Try before you buy! Hello-Hello English comes with one free lesson and the option to upgrade and get all 30 lessons. Hello-Hello’s innovative Mobile Immersion methodology engages and encourages learners of all ages to acquire usable language skills quickly! Mobile Immersion creates a unique VIRTUAL environment that GUIDES the learner VISUALLY to develop FUNCTIONAL language skills. - Virtual: Creates real-world animated situations in the new language. 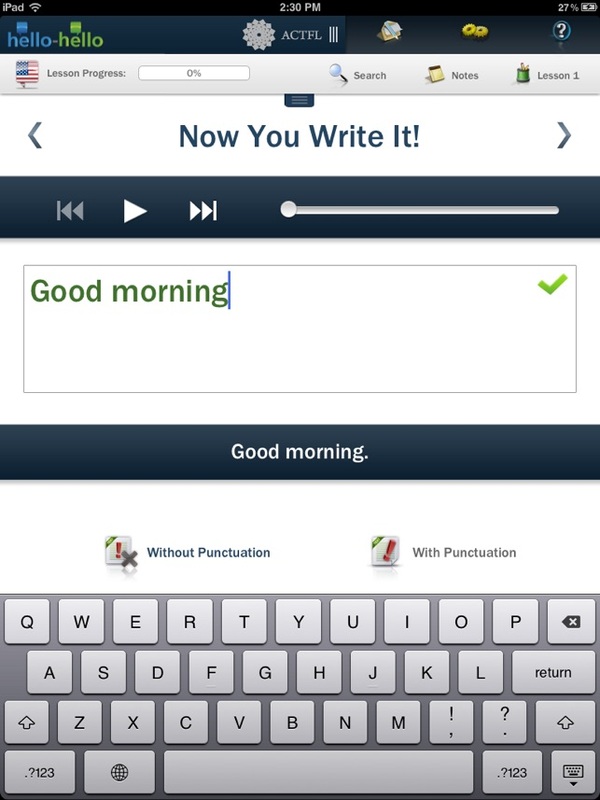 - Guided: Builds new vocabulary and phrases to develop language skills. - Functional: Develops the foundation for learners to put their new language skills to use in the real-world fast. - RESEARCH-BASED METHODOLOGY: Developed in collaboration with ACTFL - The American Council on the Teaching of Foreign Languages, which is the largest and most respected association for language teachers and professionals. ACTFL's proficiency guidelines are followed by all major schools and universities in the U.S.
- LEARN TO COMMUNICATE: Learn to communicate effectively from LESSON 1! 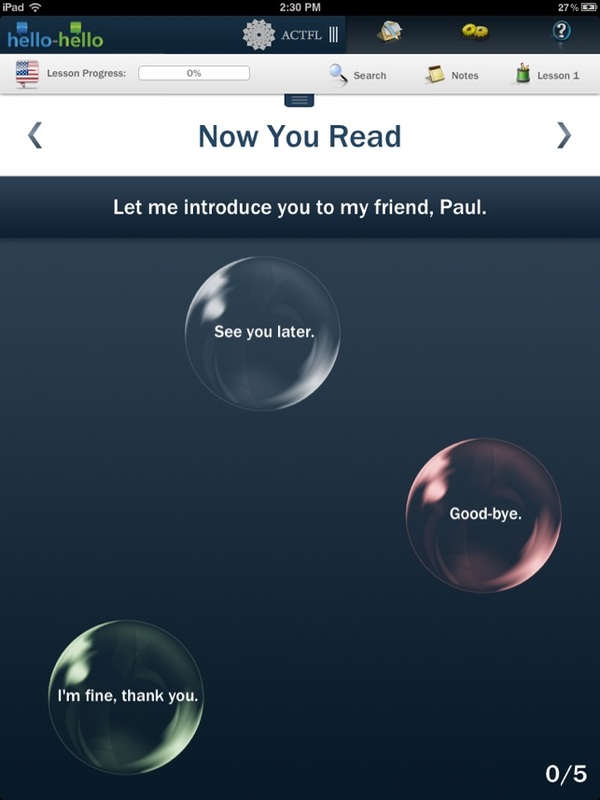 Hello-Hello offers 30 conversational lessons based on real-life situations rather then a collection of out-of-context words and phrases. - INTERACTIVE ANIMATIONS AND COMIC STRIPS: Beautiful, fun animated lessons! Meet Paul, Mark and Ann! Follow them on a trip and have fun learning English! 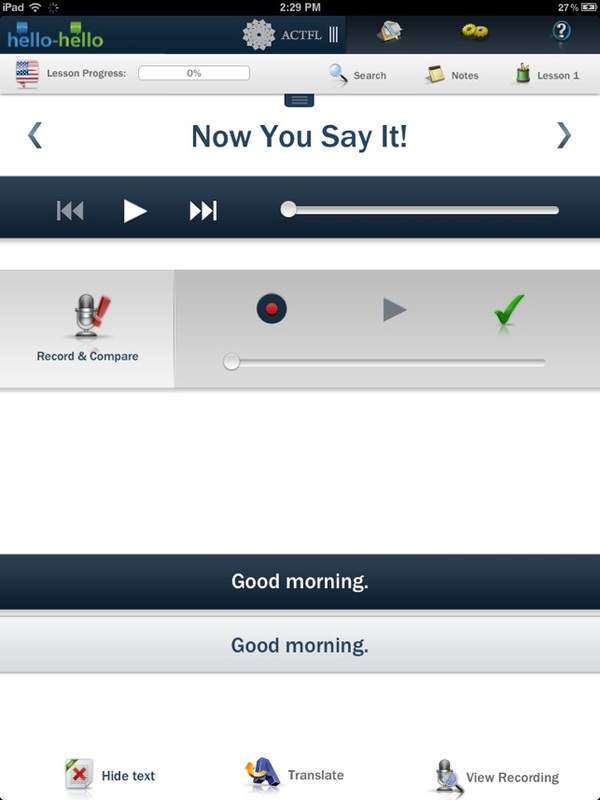 - PRACTICE ALL SKILLS: Games and exercises to practice Speaking, Writing, Reading and Listening skills! - VOCABULARY BUILDING: Practice vocabulary with our innovative “Build Your Vocabulary” exercise where you can practice vocabulary in the context of a dialogue. Receive “WORD OF THE DAY” notifications to help you memorizing throughout the day. - NOTES: Save your own notes from within the lessons to review later! - LESSON REMINDERS: Don't worry about remembering to study. We will do that for you! - TRACK YOUR PROGRESS: Track your lesson and course progress. - USER-FRIENDLY INTERFACE: intuitive interface with beautifully designed graphics. "A new and improved version of our app with animated videos, redesigned interface and additional features! Follow our adorable characters on a fun journey to learn English! -- Receive notifications with lesson reminders. The more you practice, the more you learn! -- Receive notifications with new words to build your vocabulary"
I am a fluent English and Spanish speaker and I downloaded this to help my grandmother learn English when I was not home, but when I tested this out myself the list of words and what they were supposed to be translated to where completely mixed up. Horrible 1 star. Would like to see the Japanese language added to this app. Also the flashcards could have been better if the were pictures and not just words. Those two changes for me and this could be a 5 star app. 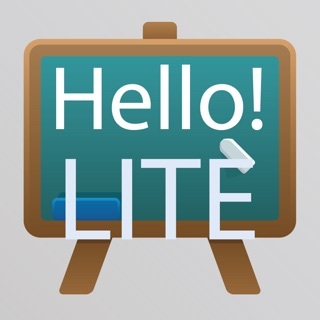 I use it to help teach English to my students. Hope to see some new updates soon.